Scott and I had errands to run in Ventura a few weeks ago and we found ourselves in search of a place to watch one of the NBA Playoff games. I have always wanted to go to Discovery Ventura because it was advertised as a fun place to drink, dine and play. So I suggested it and away we went. With Happy Hour in full swing, we both got Island Brewery Honey Blonde's to sip while perusing to food menu. The bowling area is not large but it certainly is well decorated. It is on a first come, first serve basis so get there early if you want to sneak a game in. They are open late, 12:30 A.M. Monday through Thursday and 1:30 A.M. Friday - Sunday if you are a night owl. Party time! Off the Happy Hour Food Menu we decided to split an order of the Hawaiian Sliders, Joe Style. A well seasoned ground beef patty and creamy coleslaw make for the most perfect bites. A sweet appetizer for $5 made us want to explore the menu even forever. Our server recommended we try the Chicken Tacos and told us with Highway 33's Charman's Revenge hot sauce we could not go wrong. The mesquite chicken was served on two grilled corn tortillas, guacamole, sweet tomato salsa and sliced radish was tasty but as recommended with the hot sauce it was out of bounds! 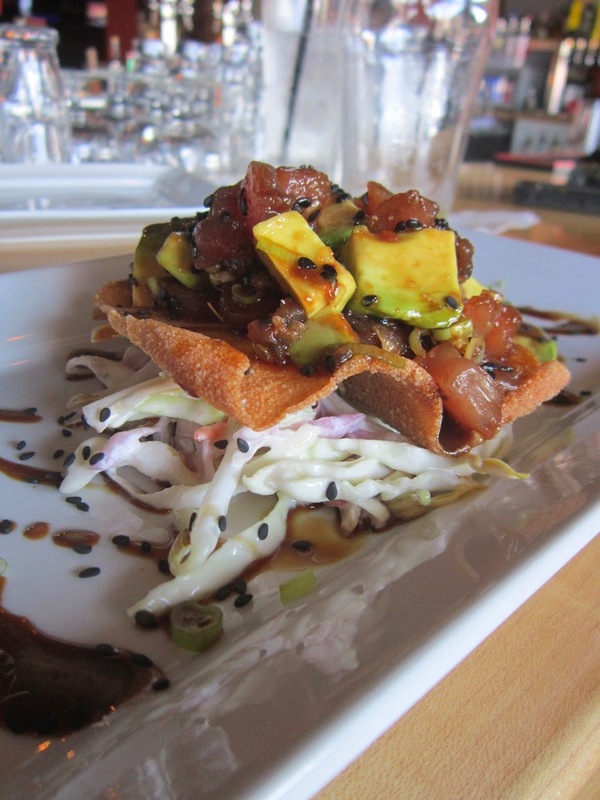 Now that I was on a roll I wanted to venture of the Happy Hour menu because the Ahi Poke Stack caught my eye. The visual was certainly pleasing and I could not wait to dive head first into it. The marinated ahi was totally fresh and marinated with a wasabi soy. The avocado was dressed in the same bath and mixed with toasted black sesame seeds and green onion. The crisp wonton was served as the tool to transport the goodness into my mouth and it too was heaven. Creamy coleslaw rested on the plate and made for a good clean up via fork or spoon. I could have sat in my seat for many more plates of appetizers but we had an early start the next day and want to get home to hit the hay. I had my eye on many more appetizers to try which included the Crab Fries, Goat Cheese Nom Noms and you know I was also interested in trying their Crab Cakes. I will be back very soon, hopefully something from their full menu which included Sea Bass, Short Ribs and a Lobster Pasta. Happy Birthday - Melissa Good Taste!